The saree is one of the most traditional outfits, and has come to be identified as uniquely Indian. It can be daily wear, dressy, or bridal. The saree itself is a single rectangle of cloth, about 6 yards long and about 1 yard wide, traditionally made of cotton or silk. The saree is tucked into a petticoat (underskirt), wrapped around counterclockwise, pleated in the center, and then draped over the shoulder. The drape can be over the right shoulder in a traditional style, or more often, over the left shoulder. The top or blouse styles have varied over time and come in an infinite variety of shapes, styles, and fabrics. Putting on a saree can be baffling, so don't be afraid to ask for help when putting it on. Even the most seasoned of sari wearers get help making adjustments to their look. There are also many online videos to help you out. Once you get the hang of a saree, you will find it to be one of the most comfortable and graceful of outfits. Another popular bridal outfit is the lehnga, usually consisting of 3 elements: a skirt, a blouse (choli), and a scarf (chunni or duputta). 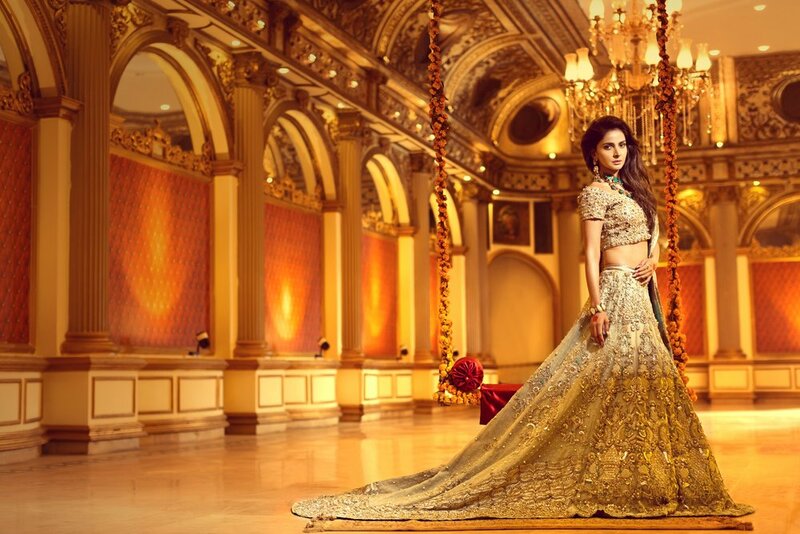 Like the saree, the bridal lehnga comes in an infinite variety of fabrics, details, and styles. It is also a good choice for wedding-related events such as a reception or sangeet dance night. For those who like the the flow of the saree and the skirt structure of a lehnga, the lehnga saree is an increasingly popular option. Reminiscent of a saree, the pleats are built into the skirt, and the fabric patterns are adjusted accordingly. For a very flowy ballgown look, nothing beats the anarkali or sharara, worn primarily for formal occasions. It is usually a lehnga type skirt with a floor length blouse. If you want to feel like a princess (or a queen), you can't go wrong with this glorious silhouette. One of the most popular types of outfits, the salwar kameez can be daily wear, or glammed up as a perfect choice for wedding guests. The pants (salwar or churidaara) are accompanied by a long blouse (chemise or kameez) and scarf (chunni or duputta). We are so excited to have you look your best on your special day! Images courtesy of the respective designers.